I know, I know this is not the right order of the quizzes. Something went wrong when I numbered it, sorry. But I hope you enjoy it. A completely new one will follow soon. The old quizzes can be made HERE. The artist Tom Baxa did a lot of stuff for the Earthdawn editions of FASA. 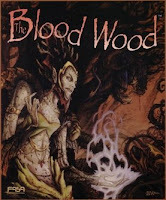 For example the cover of the Blood Wood sourcebook and a lot of interior art for several Earthdawn books. A few days ago I found out that The Gnomon Workshops featured Tom Baxa as an instructor on their new DVD. 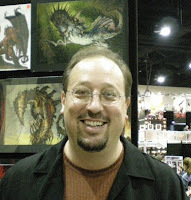 On the DVD he is creating an oil painting wherein he tells a lot about dynamic fantasy painting. A short preview of the DVD can be found on the page too. Additionally he gave an interview to Gnomon Workshops which you can read HERE. A few days ago I discovered a post of Dammi at the german fantasy forum Tanelorn wherein he announced some interesting news about an upcoming novel written by Hank Woon. So I decided to interview him about his new novel "Immortal Twilight". I hope you enjoy it. First of all I am happy to hear about the sequel of "Dark Shadows of Yesterday" called "Immortal Twilight". When I read the first book it was clear for me that a sequel has to be made. Was it planned to write a second part? Is it actually a second part? The option for a sequel was always there, and I had many disconnected ideas for one while writing the first (hence the foreshadowing at the end), but it really wasn’t until after the first book was published when the story for the sequel started coming together. I can actually thank one of the editors from Dark Shadows of Yesterday, Jacques Marcotte, for speeding this process along. Though I had some ideas already, I didn’t think I would get around to writing a sequel for quite some time. Then a certain line in the novel caused Jacques to make an offhand comment about how he could imagine the Eight Immortals of the Tower of Secrets, someday in the future, calling upon Daylen Jagaro for his services and thus prompting a new adventure. Though that wasn’t exactly what I had in mind, one of the seeds I had for the sequel involved the Immortals (and in particular their magic), and because of his comment I began picking at it. As I tugged on those threads, the mysteries of the plot slowly began to unravel; revealing themselves to me, and then it all sort of fell quickly into place. How strong is the connection to the first book, could I read "Immortal Twilight" without having read Dark Shadows of Yesterday? The connection to the first novel is very strong, but it is easy to follow the second without having read the first. Since there are many allusions to Dark Shadows of Yesterday, the reader will no doubt get more satisfaction if he or she reads the original prior, though. Please tell us what the book will be about. Do you continue the story about the journey of Daylen Jagaro in Cathay or did choose to write about other protagonists? The sequel takes place just over a year after the events of the first novel, and it is the continuation of Daylen and his adventures in Cathay. The story features several familiar faces (plus several new ones), both heroes and villains. More of Cathay and its history are revealed, and we even get to see some new POVs of some of the original cast. What is the actual state of the novel? The draft was actually turned in just over three months ago, and right now it is nearing the end of the editing phase. After that it goes to layout, a final review, and then off to FASA for approval. The poll at earthdawn.com crowned "Dark Shadows of Yesterday" as the personal favorite of several fans (even when it was close). Did you imagine that the book would earn such a great response and what do you expect from "Immortal Twilight"? I’m very glad the reviews have been favorable so far (I actually voted for The Longing Ring! ), and I hope the novel inspires a fun session or two (and inspires people to want to explore Cathay!). I personally believe—and this has been confirmed by the opinions of the editors so far—that Immortal Twilight is an even better story than Dark Shadows of Yesterday, so I imagine that anyone who likes the original will also enjoy the sequel. When thinking about that you now wrote two excellent novels taking place in Cathay, did you ever think about writing other novels taking place in Barsaive? What can we expect next from you? I know you’re not stating release dates. But we can certainly dream of a Christmas present!